There are lots of reasons our customers find they need a storage company so we offer a range of flexible, secure and convenient solutions to help. There are lots of reasons our customers find they need a storage company, whether thats for household items or something a bit more specialist. Every customer is different, that's why we offer a range of flexible solutions to help. If you're moving house but you need somewhere to store your items between moving out and your new home being ready our Removals and Storage services are a convenient and simple all in one solution. We can collect your belongings (we can even help pack too if you'd like us to) and load them directly into your storage containers using our specially designed side loading vehicles leaving you with a full inventory of the items we've collected for your records. When we return them to our warehouse they are simply taken off using a forklift truck and placed in our secure warehouse and logged in our computer system for easy location when you're ready for delivery. We then bring them back to you in the same way and unload into your new home. Loading directly into the container means we significantly reduce handling of your items, reducing the risk of anything getting damaged and lost giving you that extra peace of mind. Whether you're downsizing or just have a few items that you don't have space for at home for now we can provide great rates for long term storage with optional packing and/or collection service. Maybe you're decorating or having building works done, or hosting a big event that you need more space for, or even going overseas for a while - whatever your reason for needing temporary storage we can help with our self store or collection/delivery storage options. Bournes removals crews can provide collection services (including optional packing) and delivery services when you're ready to have your items back. This makes our storage solutions even more easy and convenient giving you peace of mind that your items are professionally loaded for maximum security during the move into/out of and time in storage. Are your storage facilities safe and secure? We own our own storage facilities so we control access completely. Our sites are fully manned during working hours and well secured at all times including comprehensive alarm systems, CCTV and secure perimeter fencing. If you'd like to come and visit our storage warehouse we'd be more than happy to show you around. How are my belongings stored? We have a range of flexible storage solutions. Our most popular storage option for household furniture is wooden storage containers. These can be loaded directly at your home or at our site if you prefer to bring your own items into store. Other options include 20ft steel shipping containers or alternatively dedicated space loose or racked storage which is great for oversized items. Do you provide business storage? Yes! We have lots of business customers who we store items for, from storing excess stock for local retailers, storing office furniture for refurbishment projects or secure archive records storage. We also provide storage and distribution services for larger commercial projects including retail store fit outs, hotel refurbishment projects or trade show and exhibition logistics. Check out our Business Moves pages for more information. How do I get a quote for Storage Services? Fill in the storage quote form to submit a web enquiry and we’ll get in touch to find out more about your storage requirements, alternatively you can call us on 01797 228000. Depending on your requirement we may need to arrange an in home storage consultation. This allows us to discuss your requirements in detail, explain how your services could work and to assess the volume of items you’d like to store. If we're providing collection and delivery then we'll also assess the access to your property, any special packing or handling requirements that might be involved. We will send your quote over as soon as possible after our consultation. Do you provide records of what i'm storing? If we load the containers for you we'll provide you a full itemised inventory so you have a full list of the items you're storing with us which will correspond with the labelling on each box or item of furniture. This makes it simpler for you to locate the items if you need to access them at any time. Where are Bournes Storage Facilities? Our storage facilities provide great coverage for requirements throughout Kent, Sussex and Surrey. Our main facilities are in Rye (East Sussex), Tunbridge Wells (Kent) and Cranleigh (Surrey). Why choose Bournes for storage? 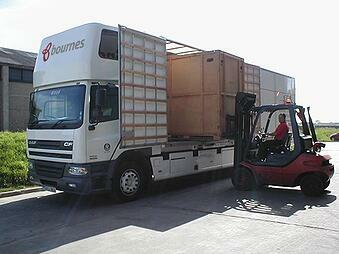 Bournes are a British Association of Removers member and Which? Trusted trader providing personal service for a range of moving and storage needs. That depends on the quantity and size of items you need to store. You can let us know the details and we'll calculate the space for you, we can either do this from a list provided by you or we can come out and visit you at home to assess this for you to provide a free, no obligation quote. How do I get my stuff to your storage facility? The We can provide a cost effective collection service with optional packing OR you can bring it to one of our storage locations yourself, whichever is your preference! If we collect and load we will provide you with a fully itemised inventory for your records.